On a recent trip to one of our other monasteries, we were treated to a tour that I will never forget. Fascinated by the aura of a pre Civil War building, it was hard to take everything in as we made our way through narrow corridors and winding staircases. The sense of entering another world was almost tangible as we approached a room that was described as “locked up and not in use.” We stood expectantly outside as our sister guide inserted her skeleton key and slowly opened the creaky door. The immense chapter room which lay before us (where important spiritual meetings had taken place) was now filled with all sorts of unused things, some appearing quite antiquated. We slowly made our way inside, adjusting to the low light filtering through the floor to ceiling shuttered windows on each side. Our eyes took in the stenciled sentences from Scripture high atop the walls, austere references to suffering and self-immolation. There was an unmistakable “presence” in that space and as we continued our tour, something lingered in us about that room and the many soul-searching movements of the human heart that must have occurred there. Its historical value was undeniable but there was something else, a lived memory, you might say, that wouldn’t go away, and perhaps had a message to give. One day, possibly, the room will have a greater purpose and be a source of new life to those who once again fill its spacious accommodations. Reflecting on this experience is another way of saying that there exists special spiritual places in our world. This month as we enter May, we would like to focus on Fatima, Portugal where Mary’s Immaculate Heart was more intimately revealed, and where preparations are underway to celebrate the one hundred anniversary of Our Lady’s appearance to the three shepherd children in the year 1917. In 1917 Fatima was described as an unknown village noted for its shepherding and agriculture. There was nothing outstanding about it, except that heaven came to choose it for one of the most significant Marian apparitions of the twentieth century. On May 13, 1917, the Mother of God appeared to the three shepherd children asking them to return six more times for an encounter with her and securing their consent to accept any suffering that might come their way for the good of their souls and for the sake of reparation for the sins of the world. In union with her Immaculate Heart, they were to undergo many different forms of affliction out of love for God. However, they would always remain faithful to their mission, proving the authenticity of Mary’s visitation to them and giving witness to the primacy of their faith even at the cost of innumerable personal hardships. It is comforting to know that God’s grace will be there to sustain us and propel us toward what is good. Yet, we all realize the responsibility which accompanies the gift of our freedom – to make our every choice and action count for the reign of God. That is an integral part of Fatima’s message, I believe. The devotion to the Immaculate Heart of Mary, features the interior aspects of Mary’s heart and lets us know that we, too, must devote ourselves to our interior spiritual development, taking it seriously. Mary is the one who teaches us the great meaning of this interiority, of drawing closer to God from one’s center of being, of valuing‘the things from above’ before all else. She is wholly turned toward the Father and invites us to follow her lead. She is the immaculate one whose unblemished trust bears the fruits of the Holy Spirit and who tells us that the more we place our trust in God, the more spiritual fruit we will bear as well. However, in such a place of prayer and with such a message of significance for our world, there is bound to be controversy. Fatima is no exception. Some will point to Fatima and say that it fosters religious fanaticism in its followers, some will zero in on our Lady’s request for the consecration of Russia and say it was not properly carried out, some will assert that the ‘third secret’ was never fully or truthfully disclosed, some will insist that what Fatima represents is irrelevant in a society that no longer has need of God’s guidance. It is as if the powers of darkness are unleashed against any attempt to convey spiritual truth to the human mind and heart. In this world, the struggle for redemption still goes on, even in the very places where it is deemed secure and reliable. Mary’s appearance at Fatima came at a crucial time in human history when the grip of destructive forces were unleashed upon the world through godless ideologies. These godless ideologies are still with us fighting for possession of the human heart. Through the Immaculate Heart of Mary we are given a means of working through the blurred thinking of our day, making ourselves available to the light of the Holy Spirit, as she was, and enabling us to properly assess how God is really leading us. Mary desires our hearts to be in tune with hers where we can join her in pondering over God’s presence in our everyday lives, in entrusting ourselves to God’s providence through difficult situations, and in standing true to our faith under the cross of her Son. 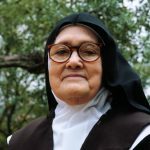 Some time ago a book was being passed around in our community called The Intimate Life of Sister Lucia. The entire back cover of the book had a photograph of Sister Lucia taken in May of the year 2000 at her Carmelite monastery at Coimbra, Portugal. 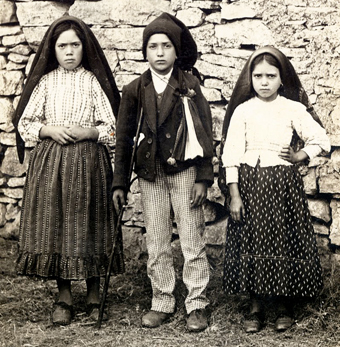 Sister Lucia, the only surviving seer of the three children who saw Our Lady at Fatima, was in her early nineties at the time of the picture. Looking at her face I was drawn by its serene joy. She had the gaze of someone who seemed to be peering into another world. 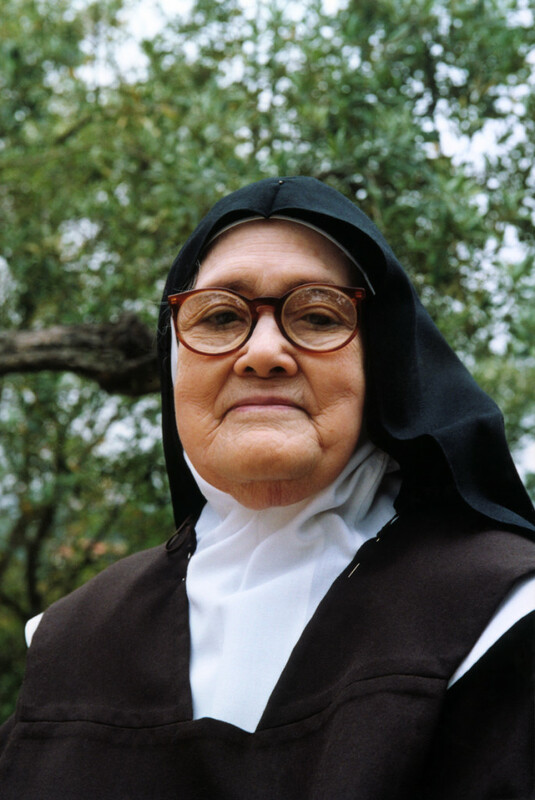 While I am sure that her contemplative lifestyle contributed to her peaceful countenance, it is good to remember that Sister Lucia’s entire life’s mission was concentrated on the dismantlement of evil in our world, in particular with halting the errors of atheistic Communism. Her battleground was mainly the interior world of the heart, where she came to understand what God wanted for the world and what recommendations Our Lady advocated for those who wished to attain their eternal salvation. There is always a sense of urgency in the messages of Mary, and we should take this to heart. So many apparitions do not come without a heavenly purpose. The children of Fatima who received Mary’s messages were very changed by their encounters. Their faces reflect a seriousness and depth. They are totally absorbed in the inner dynamics of God’s revelation. We too are confronted with the mysteries of heaven on earth in looking at them, even one hundred years after the fact, and are reminded that their presence is with us still. 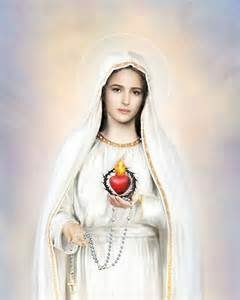 If we truly wish to honor the Immaculate Heart of Mary in this upcoming year commemorating her appearance at Fatima we can familiarize ourselves with her requests: 1) prayer, especially recitation of the Rosary; 2) reparation for sin; 3) consecration; 4) the completion of the five first Saturdays consisting of Confession, Communion, recitation of the Rosary, meditation on the mysteries of the Rosary (for a quarter of an hour). Mary has promised to honor our sincere efforts by assuring us of interior peace that only God can give and the gift of final perseverance in our passage to heaven. This talk on Sacred Heart Spirituality was given on May 1st, 2016 by one of the Sisters of the Visitation of Holy Mary at the Visitation Monastery in Tyringham, Massachusetts. The next talk will be held on Sunday, June 5th, 2016 at 4:00 pm. All are invited to attend.